Getting schooled at the Bridgestone Winter Driving School. The Tacoma was present, but not available for our drive. Ah, winter — the least favorite season for many of us as cold temperatures, snow, and ice often prevail, especially throughout snow country. I grew up in New Jersey and now live in the “sunny South,” but we have our share of wintry storms, usually delivering more ice, than snow. That makes for treacherous driving conditions, something I’ve learned to avoid by waiting for the roads to clear before heading out. I’ve written extensively about tires, including the importance of checking air pressure regularly (at least monthly), rotating tires, and replacing them once tread levels fall to 2/32 of an inch. Tires are the only thing that separates thousands of pounds of vehicular mass from the road — if they’re not in optimum condition, the risk of a flat or a blowout increase, what may lead to a serious accident. 1) Winter tires are an added cost and must be swapped out with your regular tires before the season arrives and changed again in the spring. Storing tires can prove challenging, especially for anyone who rents their home. Fortunately, some tire dealers will store your extra set of tires if you do not have space. 2) All-season tires are enough, right? Drivers may be under the impression that all-season tires are sufficient. After all, all-season means four seasons, but that’s not entirely accurate. Although all-season tires can be driven throughout the year, they do not provide the extra amount of grip needed for snow-covered roads. Bridgestone Blizzak tires manage snow better than all-season tires. So, let’s cut to the chase here: winter tires are necessary if snow conditions are a regular part of your driving experience wherever you live. In my area of central North Carolina, they’re not necessary. But in mountainous regions such as Boone or Asheville, drivers should use them and not just on the axle that drives the car — but on all four corners. The Bridgestone Corporation is the largest tire company in the world; in addition to its eponymous tire brand, the company also owns Firestone. Visit any Firestone retail dealer and you’ll find both brands on display. The company claims to spend at least $1 billion annually on research and development. Moreover, Bridgestone has a strong presence in sports sponsorships, including the Olympics (the company is one of 13 global sponsors of the games). 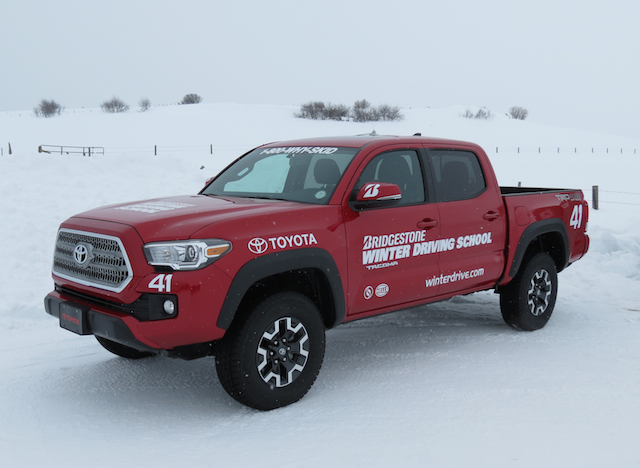 The company also manages the Bridgestone Winter Driving School in Steamboat Springs, Colorado, a program I was invited to attend. Along with seven other media professionals, we participated in an intensive one-day hands-on class. A higher level and more intensive two-day option is also available and routinely enjoyed by enthusiasts. Fittingly, it was on Groundhog Day when we took our class when a certain fat Phil in Pennsylvania indicated we still had six weeks of winter remaining. Meanwhile, at an elevation nearing 7,000 feet in northern Colorado, the season is just getting started — several feet of the white stuff were on the ground and a brewing mid-day storm was to add another five inches. Classroom instruction time involved multiple slides along with instructor input. Before heading to the track, a Bridgestone instructor provides an hour of classroom instruction, outlining what’s ahead for the day. Winter tire basics were covered, including pointing out the superior stopping power of these specially designed tires. Indeed, if you were to place similar cars side by side and outfitted one with all-season tires and the other with a set of winter tires, the latter provides a 33-percent shorter stopping distance. That’s not just a helpful advantage, but it supplies the assurance you need when roads are snow packed. Winter tires are important for several other reasons, including having the capability to cover the vehicle’s weight and load, to transmit acceleration and cornering forces, and to cushion road irregularities. Potholes, anyone? Bridgestone offers two lines of its branded Blizzak winter tires — WS80 and DM-V2. The studless Blizzak line rolled out in the late 1980s, building on a pair of earlier ice and multi-cell tire technologies. The changes through the years have yielded modifications to channel installation, including chain and mega bubbled compounds. In more recent years we’ve seen the introduction of so-called hydrophillically augmented tires for improved grip. After a thorough safety briefing, media folk was sent to the BWDS driving campus for a vehicle orientation. 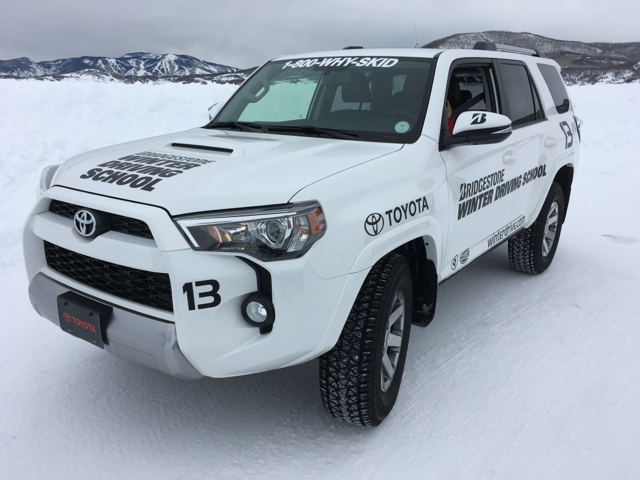 Here, Toyota partnered with Bridgestone, supplying an assortment of models, including the midsize Camry sedan, 4Runner SUV, and the compact RAV4 crossover. A Tacoma pickup truck and a small fleet of 86s was also present. Alas, the latter group of vehicles was not made available to us. Off to the races we go. The track introduction was hands-on — a BWDS instructor took us out in pairs, drove the track, and explained what the color-coordinated cones along the route meant, as well as the numbered “lollipops” representing each turn in the course. Once the introduction was over, each student took turns navigating the course. If you think for a moment your winter driving skills are impeccable, BWDS will challenge you in ways you might never have imagined. Yours truly prides himself in not just being a safe driver, but as one who knows how to handle a variety of emergency situations. I got schooled quickly as one of the instructors, John — a race car driver from Colombia — pointed out a few of my shortcomings. For one, I tend to take both hands off the wheels at various times while driving, a habit I never noticed before. Also, I usually grip the steering wheel at a 10 and 2 position — where the grips are located — instead of the recommended 9 and 3. That is, when I have both hands on the steering wheel — yes, I drive with one hand from time to time or may rest one hand on the bottom of the wheel. What you may get away with in normal conditions can prove dangerous when roads are slippery and you must react fast as I was reminded. The drive around the course is about a mile long, marked by 11 sharp turns and a fair share of ascending and descending legs. Immediately, we learned that turn No. 4 was the most treacherous one of all, offering a 180-degree turn, exacerbated by uneven road. In dry conditions, the road would be hazardous enough. In wet conditions — in this case, packed snow and ice — the risk level only worsens. Then again, that’s the reason for driving on winter tires — you need every bit of grip possible to navigate — even if your speed is something like 3 mph. Place winter tires on all four corners. If you’re considering winter tires, you’ll want to place them on both axles, not just on the one that turns the wheels. Back in the day when I learned how to drive, we placed “snow tires” on the rear axle only — unless you were one of the very few people who owned a front-wheel drive model, then the tires were placed up front. No one thought about a set of four, but the full set makes sense, especially since we drive many more miles these days than we did a few decades back. A set of the same tires on your car ensures even handling — it can be a bear to steer a car that has winter tires on one axle and radial tires on the other axle — especially at highway speeds. Now back to the driving school — BWDS isn’t meant to humiliate anyone. Instead, it serves as a reminder of how to handle wintry conditions. Indeed, even though I know in my mind to turn into a skid, there was one incident when I didn’t. That led to our 4Runner slamming into an embankment, but fortunately without damaging the SUV. How embarrassing it was for this driver who hasn’t done much winter driving over the past 12 years. 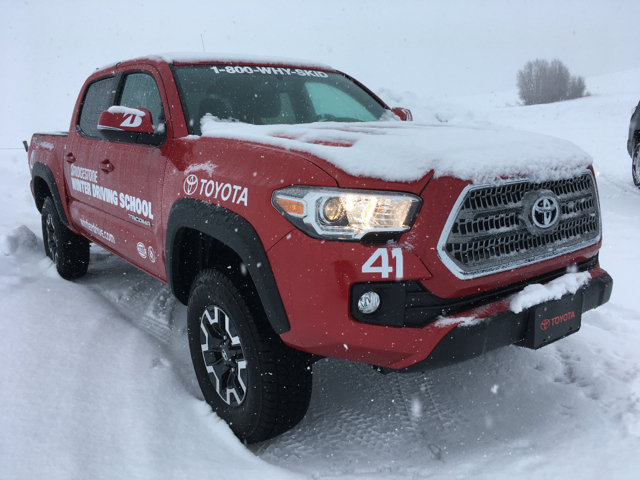 To give students a comparison between winter tires and all-season tires, we finished our day with Toyota vehicles outfitted with the latter. Above freezing temperatures made it more difficult to distinguish between the two tire types, but I did notice the reduced grip with the all-seasons. Had the ambient temperatures remained below freezing, the differences would certainly have been magnified. The Toyota 4 Runner was our preferred test vehicle. Speaking of all-season tires, a Bridgestone executive agreed with my assessment that all-seasons are more like three-season tires — yes, you can drive on them in the winter, but if wintry conditions prevail, the best grip is offered with the winter tires. As for summer tires, they’re truly performance tires and are usually outfitted on cars destined for the track. Regardless, you don’t want to drive on summer tires below 40 degrees Fahrenheit — the tread compound used works best in warm and hot weather. In cold weather you’ll hear the unmistakable clomp, clomp, clomp of the tires as you drive, with a real risk of compound cracking, effectively destroying the tire. Olympic medalist Bonnie Blair graciously shared her bronze medal with the media. I gave it back! One of the surprises served up by Bridgestone at a welcome reception held the night we arrived was a visit by Olympic speed skater medalist, Bonnie Blair. It took me a few moments to make the connection, but when I did I realized that this petite lady medaled at three Olympics from 1988 to 1994 — garnering five gold and one bronze medals. Blair may have been on hand serving in her capacity as brand ambassador for Bridgestone, but she didn’t talk about the tire company. Instead, she shared details about her experience on the ice, how the sport has changed — blades now partially separate from the boots when taking turns — and offered details about her own family, including her teenagers. Blair spoke effusively about the Olympics, sharing the importance of representing one’s country and racing against the world’s finest athletes. In that regard, she certainly embodies what Bridgestone is all about — it is the world’s largest tire manufacturer with a truly global outlook. Disclaimer: Bridgestone hosted yours truly and a pool of automotive and lifestyle talent for two nights in Steamboat Springs, Colorado. The tire manufacturer covered airfare, our hotel stay, and meals. Swag items included a hat, scarf, and a video.